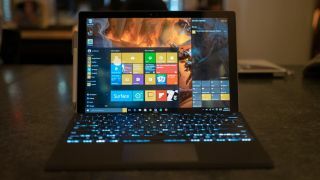 Ever since the launch of the Surface Pro 4 back in 2015, some models have been afflicted by a flickering screen problem that pretty much ruins the experience of using the device. While some devices have been helped by a software patch, the problem has persisted for a small number of users. Now Microsoft is giving up on trying to deal with the issue via software updates, and says it will just replace the models that are still not working properly. If that means you, you can get a refurbished Surface Pro 4 straight from Microsoft. Having to live with a screen defect for months sounds like it would get frustrating rather fast, but at least Microsoft has finally got around to putting an end to the issue... hopefully. Microsoft says it might take 5-8 business days for your replacement to arrive from when you send off the faulty device. "After careful examination, have determined that a small percentage of Surface Pro 4 devices are exhibiting a screen flicker that cannot be addressed with a firmware or driver update," says Microsoft in a support note. "To support customers affected by this issue, we will replace eligible Surface Pro 4 devices for up to three years from the date of purchase, free of charge." The offer applies to both consumers and commercial customers, and if you've already paid to get your Surface Pro 4 fixed, you'll be able to get a refund. The offer only applies to Surface Pro 4 devices and only to the flickering screen problem – for any other problems, you need to go through the usual repair or replacement channels (and that includes screens that you've damaged yourself).